We understand that selling your house for top-dollar is extremely important to you and appropriate pricing is the key to getting top-dollar. Let us share with you what overpricing can do to the eventual sales price you receive for your house. YOU WILL LOSE THE EXCITEMENT A NEW LISTING GENERATES. REALTORS are working with buyers who have seen what is currently on the market and are waiting for something new to be listed. Therefore, the most activity will take place in the first 30-days of a listing. Your house will probably receive its highest and best offers during this time. After this initial period, the only people who come to look at your house will be new buyers in the marketplace. Buyers will view only the properties that are priced within their purchasing power, knowing they cannot afford anything above their price range. Overpricing helps sell other, more competitively-priced houses first. YOUR HOUSE MAY BE USED TO SHOW THE VALUE OF OTHER PROPERTIES. Your objectives should be to enter the market in a position that will attract prospective buyers, not drive them away. YOUR HOUSE MAY BECOME STALE IN THE MARKET. Buyers may wonder why your house has been on the market for so long or if there is something wrong with the property, even after you lower the price. 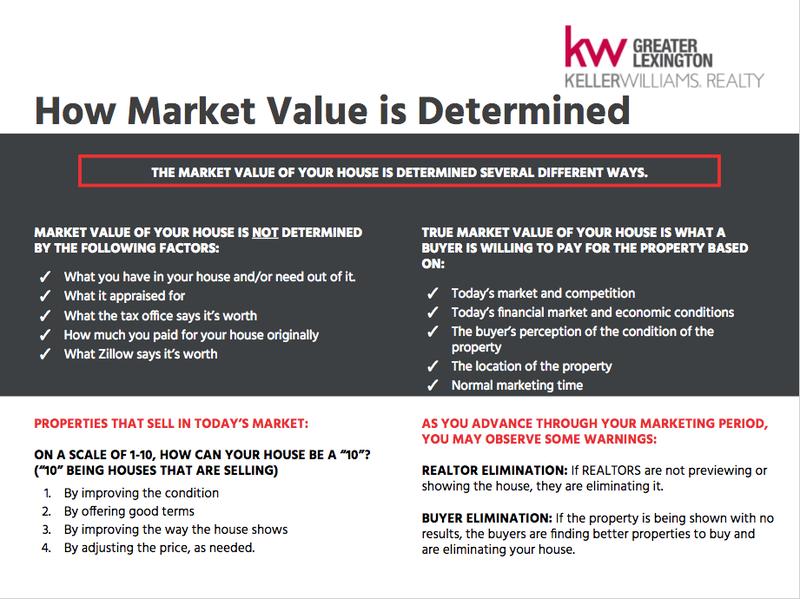 You may even have to settle for less than market value. A house takes on a reputation surprisingly fast, so don’t wear out your welcome on the market.